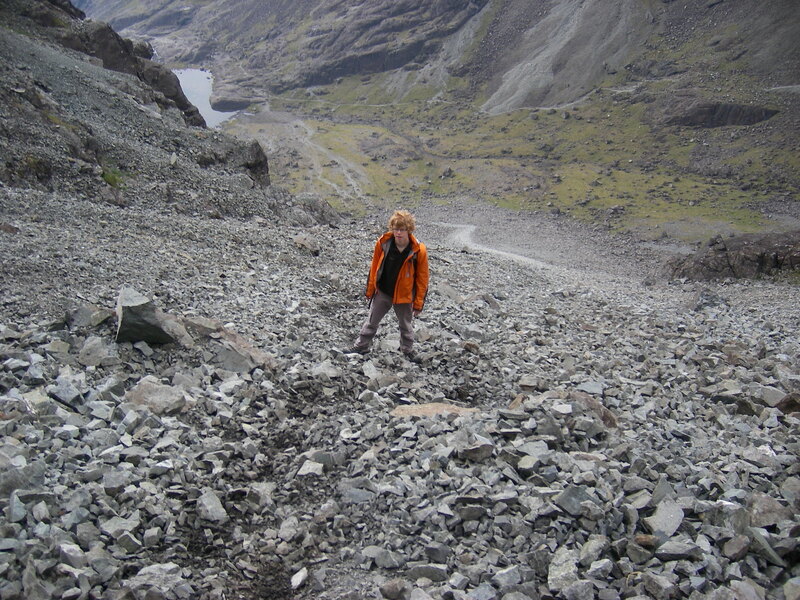 Sgurr Alasdair : Scree heaven! Fancy a gourmet meal of scrambling delights ? 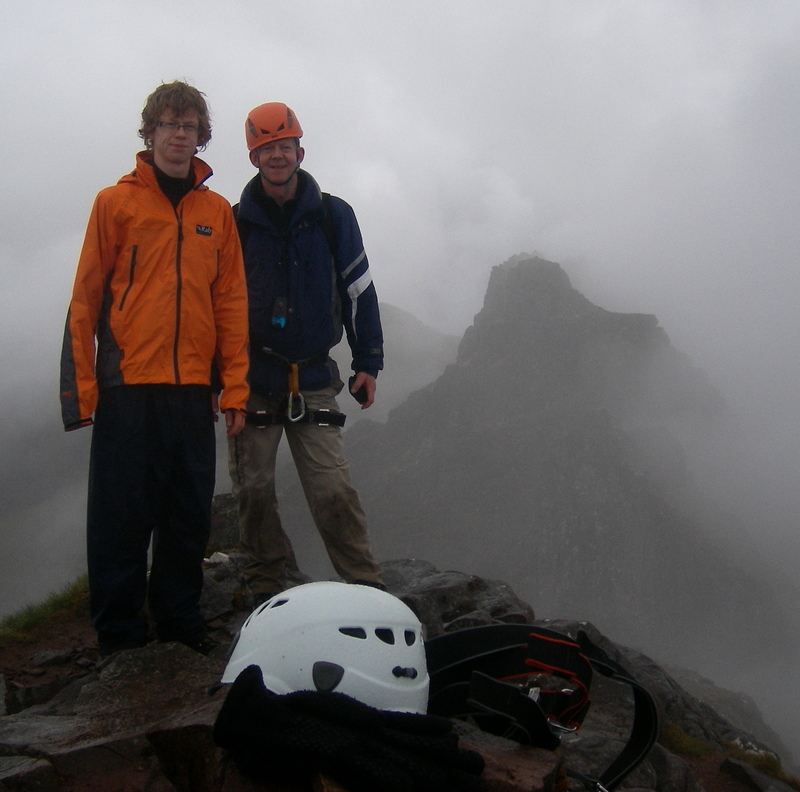 Sgurr Alasdair delivers the perfect tasting menu, making it one of the best day’s scrambling in the Highlands! For starters there is a beautiful loch nestled within a classic corrie, the main course is a scree slope to die for and pudding comes in the form of fantastic views covering the entire Cuillin ridge to the North – with an awesome vista of Scottish Islands to the South. Start point is the small campsite at the end of the road at Glenbrittle. 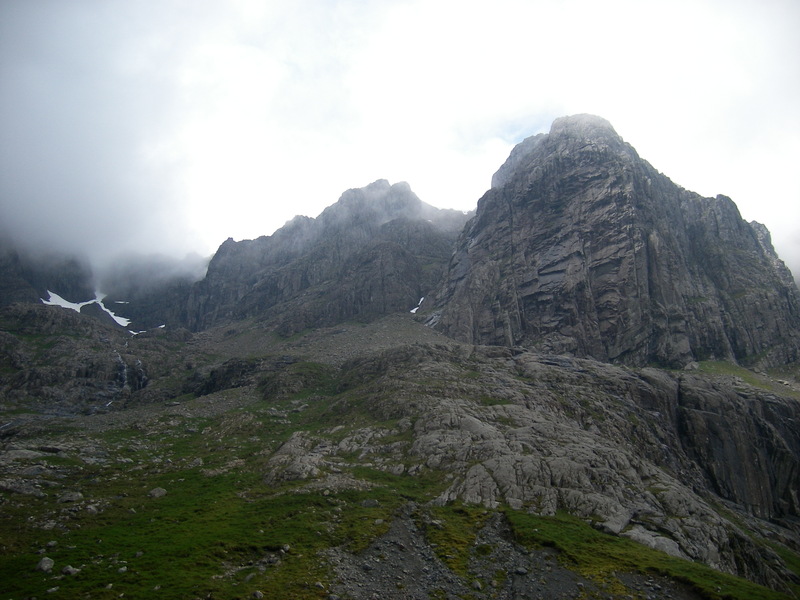 The route follows a reasonable track heading directly towards an obvious corrie (Coire Lagan). After a while you can leave the main path and climb up the huge, smooth rock slabs towards the corrie lip, all the time the amphitheatre of foreboding cliffs drawing in around you. The Cuillins are all about Drama. The landscape is schizophrenic : smooth red lumps on one side, spiky black rocks with attitude on the other. 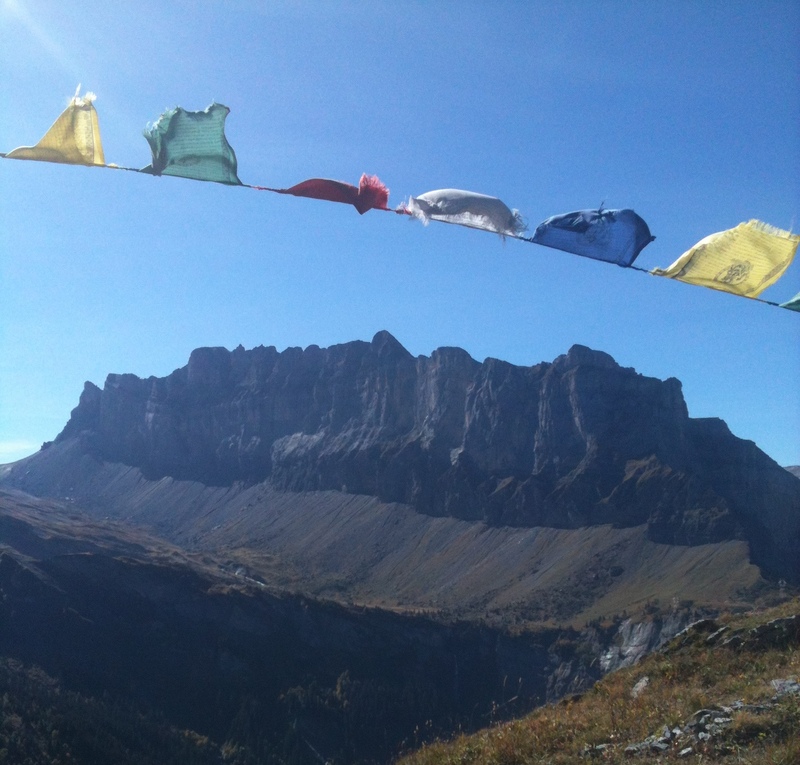 Bruach na Frithe is definitely in the latter camp : one accesible peak in a gang of malevolant pinnacles. This is a classic day out in the Black Cuillin, with views that fix themselves for ever into your memory ! To make life a little easier, you start and end this walk at the iconic Sligachan Inn, just the place for a pre-walk fry-up and a post-walk pint of ‘Red Cuillin’. Walk in along the Alt Dearg Mor burn, following this for a few miles. Leave the main track at Coire na Circe and head quite steeply up the path towards the obvious corrie between Sgurr a’ Bhasteir and Bruache na Frithe. From the Corrie basin, head straight up the rocky rim towards the lowest point of the ridge (Bealach nan Lice). 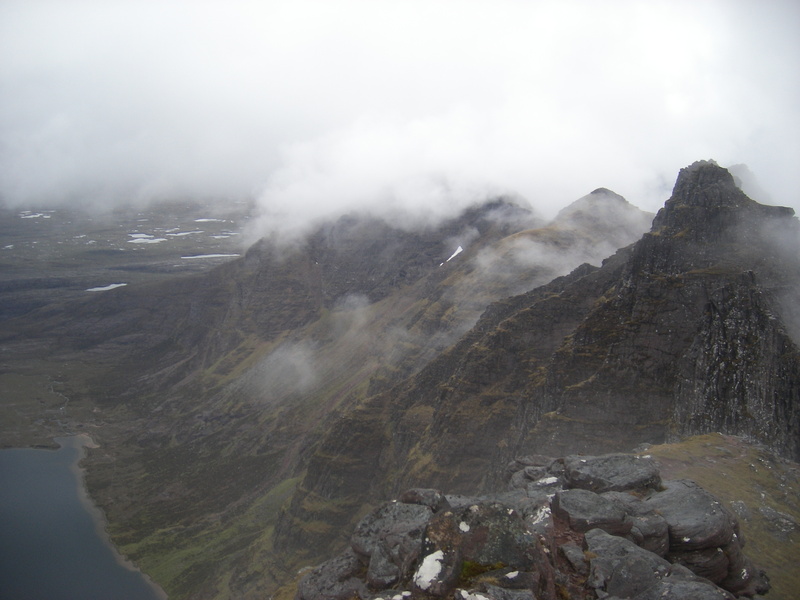 Here the vista changes suddenly, with the view dominated by the fearsome pinnacles of Am Basteir (the Tooth) and Sgurr nan Gillean (pictured left). For best effect, take a short detour left to climb Sgurr a Bhasteir, the spur taking you out at right angles to the main ridge. Turning around you get an awesome view of the Black Cuillin at it’s best. 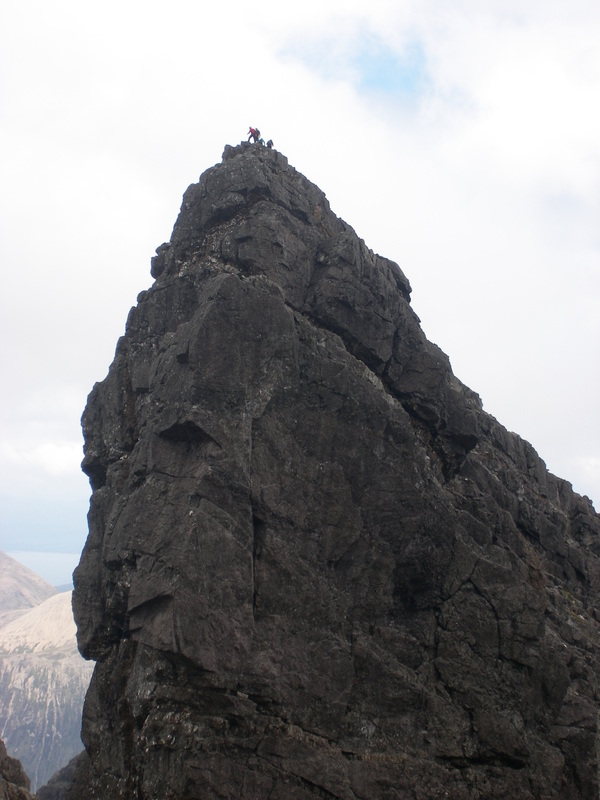 Whilst the Bhasteir Tooth is reserved for experienced climbers, there are ways up Sgurr nan Gillean for expert scramblers. This involves a traverse of the south face, overcoming the obligatoy ‘bad step’ on the ascent. Sam and I climbed Ben Nevis a few years ago via the Pony track – and ever since then we’ve wanted to do it by the ‘other’ route – the CMD Arete! This is a challenging day out and not for the faint hearted – but you wouldn’t be reading this unless you were made of sterner stuff! Ben Nevis is not the objective here, even though that’s where you end up. This route is all about the journey – and what a journey it is. 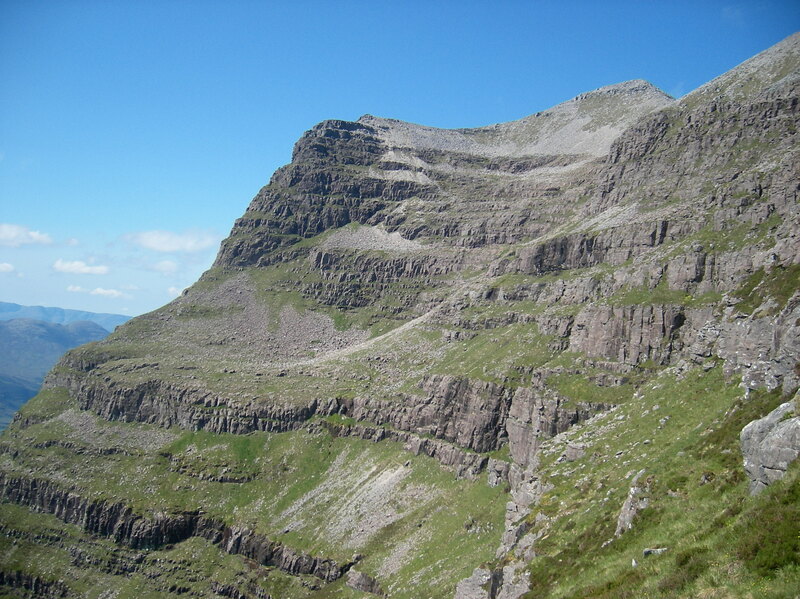 Torridon is the Glen of Giants : Beinn Eighe, Beinn Alligin and scariest of all, Lithach! Every budding scambler should spend 1/2 a week in this fantastic setting : great scenery, iconic mountain ridges – and a fantastic pub for long evenings reliving hairy moments from the day! For relative luxury, try the Torridon Inn (where the excellent bar is), or for those on a budget the Youth Hostel is the place to go. Easiest way on to the ridge is to follow the stream (see the map below). The going is rocky and you’re starting from sea level – but the view ahead spurs you on.